The StoreWALL Small Tote Bag (Grab & Go Bag) is made with heavy duty tear-resistant canvas. It is perfect for storing items for quick and secure access. These bags include mesh panels for visibility and circulation, which makes them perfect for athletic items such as uniforms and shin guards.The hook used to hang the Large Tote Bag are the 300mm Universal Hook. You require 2 of these. They are sold separately. 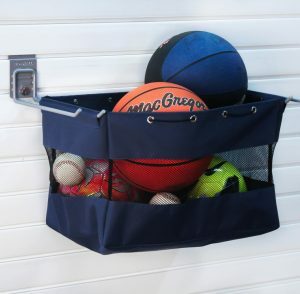 StoreWALL’s range of Garage Storage Tote Bags also come in a Medium and Large size to suite your every need. Love your Cricket? Utilise the Tote Bag for all your sporting balls. Whether its Tennis balls or Cricket balls, once expanded your Tote Bag will secure them all for you. Being a Tote Bag, means if you want to take them with you you can simply slip the bag off the Universal Hook and off you go. The StoreWALL Small Tote Bag can manage up to 9KGs in weight capacity. Do not over pack the bag to prevent the seams from stretching or tearing.